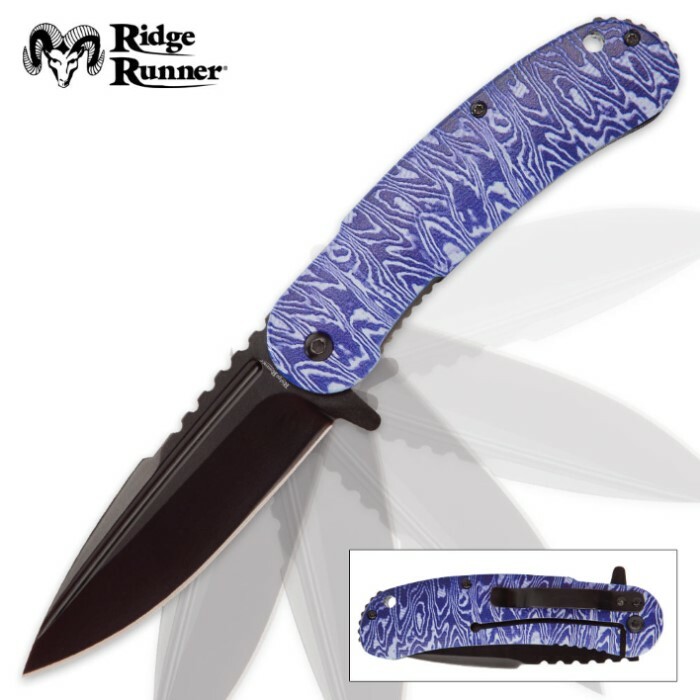 Ridge Runner Blue Tie-Dye Pocket Knife | BUDK.com - Knives & Swords At The Lowest Prices! The Blue Tie-Dye Pocket Knife from Ridge Runner has a groovy retro look with its eye-catching tie-dye pattern. The blue dizzying swirls have been 3D printed on the sturdy G10 handle, giving it a unique textured grip. The 3 3/4” blade is of black stainless steel and has a deep blood groove and back notching. Deploy the blade quickly using the flipper to engage the assisted opening mechanism. A black stainless steel pocket clip lets you carry this pocket knife with ease. 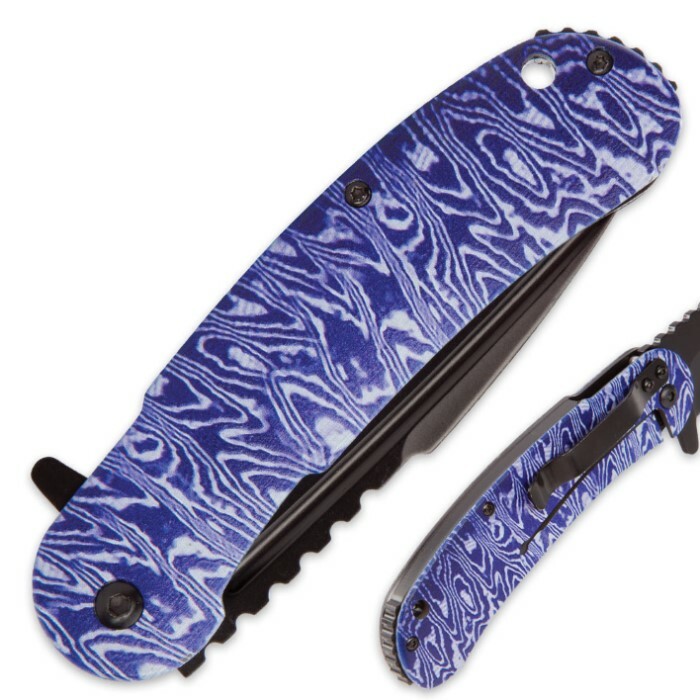 Indulge your Sixties nostalgia with our Ridge Runner Blue Tie-Dye Pocket Knife. This is one great knife for the money! The knife is build soild. I bought 10 of these knife for a Christmas gift. This knife is a very good buy. It's built solid, comes sharp, looks good,and is priced right! This handle has good texturing and the blade is fairly sharp. One review noted the missing spacer, but I don't see that as an issue with a budget knife and this thing is heavy enough already. Got one for all my bags. Great shade of blue. More of an indigo than a blue. Fast, sharp, and heavy. Ridge Runner rules. Thanks BudK! Nice...but since my girlfriend got it for me it is an AWESOME gift. Not G10 the (magnet stick; not aluminum). No spacer as pictured. Flow through design. Heavy. 3 stars simply because of picture/information being wrong.